Boston Firsts is about everything (well, almost!) that happened first in Boston and changed life elsewhere: from the first lighthouse and public library to the first madam and ready-made suit. 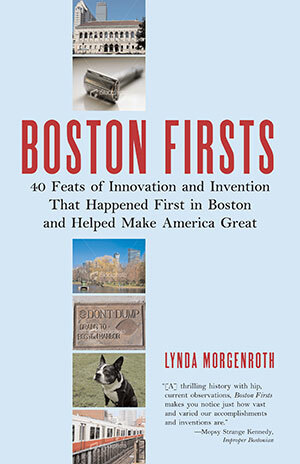 Boston-based journalist and essayist Lynda Morgenroth has written forty original essays on the city’s long history of innovation, from the colonial era to the present. These lively takes on Boston’s innovative history range from the first use of ether in publicly performed surgery to the first school desegregation court case to the one and only automatic bargain basement. Consider this: Ice cut from Boston ponds and shipped to hot climates became a worldwide industry. A controversial kidney transplant between twin brothers marked the start of organ transplantation. The glorious Massachusetts 54th Regiment was the first black army regiment in U.S. history. First newspaper, novel, subway, telephone, gay marriage the beat goes on! Ranging from advances in science and engineering the smallpox inoculation and the Boston Harbor cleanup to innovations in culture and society Fannie Farmer’s cookbook and the YMCA the collection investigates, celebrates, and integrates America’s workshop of ideas.